The field of public administration is progressively—and I believe unwittingly—shifting into a new philosophical paradigm. This paradigm is the antithesis of the historical philosophical foundations established by George Frederickson in the “New Public Administration” and Robert Denhardt in the “New Public Service.” Where these historical paradigms emphasized the values of consensus, shared ideals, democracy, social equity; the emergent anti-government paradigm advocates self-interest, individualism, competition, Machiavellianism and survival of the fittest. The writing of National Security Advisor H.R. McMaster and National Economic Council Director Gary Cohn in the Wall Street Journal exemplify the philosophical foundation of this new paradigm, as do the statements made by Budget Director Mick Mulvaney in his explanation of the policies embraced by the 2018 federal budget designed to emasculate the federal social safety net. McMaster and Cohn dismissed decades of systematic effort to create and develop collective security, where the value of international cooperation would facilitate peace and social progress. They emphasized that the world is not a global community striving for shared aspirations, but instead an arena where nations compete for advantage. Mulvaney added clarity to this paradigm when he described the purpose of the 2018 budget as a platform for those who “pay taxes” to remove themselves from the responsibility of paying for benefits received by those on public assistance. Mulvaney’s implied theme was to force personal responsibility on those who pay lesser taxes, or no taxes at all, by reducing the public assistance they receive. He implied this model would theoretically improve the economy by enhancing the income of those who pay for public assistance benefits. The philosophy espoused by the Trump Administration advocating deconstruction of the state and claiming government to be a failure in what it has historically attempted, is a noteworthy progression for the new paradigm, the attack on government and the field of public administration that has been ongoing for several decades. President Reagan with his belief government in general was the problem which impeded societal success built the modern foundation for discrediting public institutions. The emphasis on individualism personified through libertarianism, and government being the problem in societal progress, has grown as the guide star followed by much of our current political leadership. Complimenting this philosophical movement, the theoretical platform developed by reinventing government in the ‘90s, with its emphasis on treating citizens as customers helped inculcate new generations of public administrators with a public value system oriented to individualism, with customers and market based efficiency serving as key values, replacing equity and shared responsibility. The decades of anti-government, libertarian rhetoric have been instrumental in persuading the American people to believe government is the problem and is not a body that can assist in correcting the structural problems that exist in our society. This long-term anti-government campaign has successfully implanted an assumption in the public psychic that failures they perceive in the country’s economic structure, civic or social structure are a direct result of failed social engineered solutions imposed by a strong government. A 2017 PEW poll shows evidence of this where 66 percent of American saying they are dissatisfied with the way things in America are going, and only 20 percent expressing confidence the federal government will do the right thing most of the time. The field of public administration is at a critical place of reflection. The foundation on which American public administration was built is now held in disrepute by much of our national political leadership, and that opinion is reflected in this emergent paradigm. This emergent philosophy, focusing on an anti-government platform with a value system embracing economic individualism, is a direct contradiction of two ethical principles articulated in the ASPA Code of Ethics, as well as the first objective in the ASPA strategic plan. The first ethical principal in the code calls for advancing the public interest, while the fourth ethical principal advocates for strengthening social equity. In addition, the first goal in the ASPA strategic plan advocates for a strong effective and ethical public governance. Each of these are being challenged by this “new” paradigm of public administration. Although there are some writings which confront this emerging paradigm, as well as a few which disagree with the premise of this article, most of the current literature focuses on traditional technical, administrative, leadership issues and ignores the fundamental restructuring of the profession, and the country, that is underway. Public administrators may informally be discussing these trends and the value changes they require, but public discussion concentrating on the changes occurring in the American structure of public administration are not at the forefront in our professional dialogue. 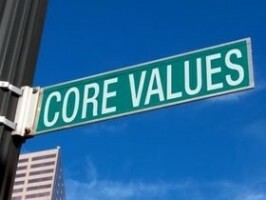 If the paradigm which sets the values and guides the actions of public administration is to dramatically change, should we who serve in the profession not openly and comprehensively debate that change, along with the values modification that will be required? I believe we should have these discussions through an active platform sponsored by ASPA, charged with debating the wisdom of the paradigm change that is occurring. Speaking truth to power has never been more important for public administration in America than it is now. Mr. Abels is correct that there has been an ongoing effort to ignore all of what government provides to our fellow citizens – the vast majority of which would not be provided without government – and instead to focus on shortcomings. The question this raises for me is: how are citizens to find out about all the benefits that they are getting from their government? Government organizations are usually forbidden from doing outright public relations work This means that their ability to let the public know of their accomplishments is relatively minimal, particularly when compared to the resources that anti-government advocates can bring to bear. Information on the benefits provided by government are available in some government budgets and reports but these, when compared to the wealth of anti-government stories in various media, are far less accessible to the average citizen. Government unions provide some of this information but are, understandably, more focused on the welfare of their membership than on touting the accomplishments of the organizations in which their members work. The work of government employee organizations, such as the National Active and Retired Federal Employees Association, is similarly focused. There currently seems to be no organization which makes it easy for U.S. citizens to easily find out what benefits their tax dollars have purchased. How can they be expected to make informed decisions on the costs and benefits of our government when they do not readily have this information?